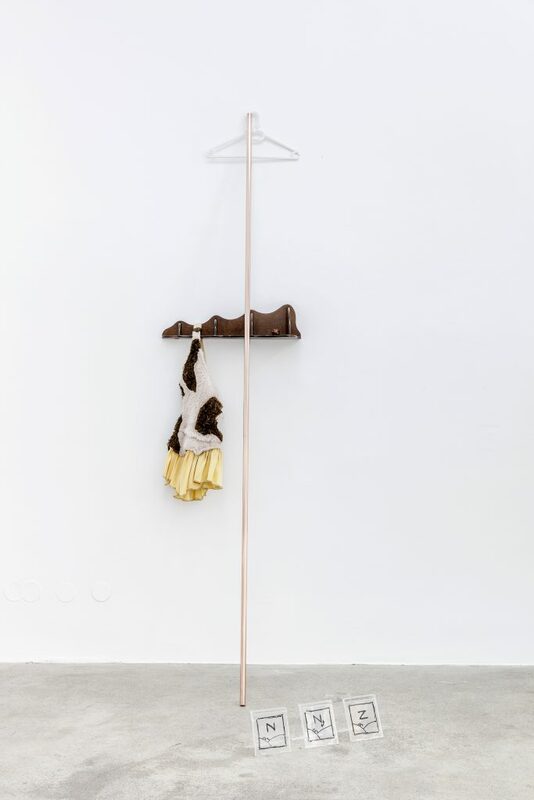 Sophie Jung, It’s Not What It Looks Like, exhibition view, Sophie Tappeiner, 2017. Photography: www.kunst-dokumentation.com. 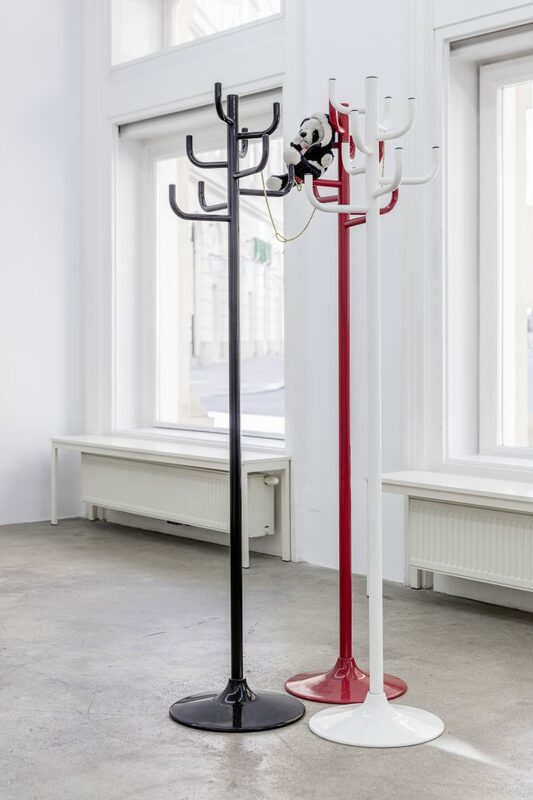 Sophie Jung, Tragedy Upon Tragedy, 2017. 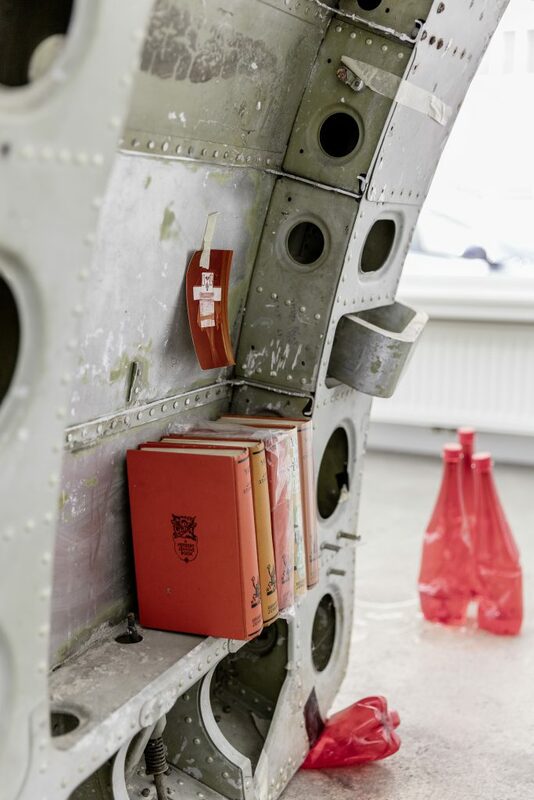 Airplane door, bird stickers, noteboard, plastic bottles, resin, metallic tape, photograph (artist’s mother) same book in different editions (artist’s father in law’s collection) rusty bolt, packing foam, tar paint, dimensions variable. Photography: www.kunst-dokumentation.com. 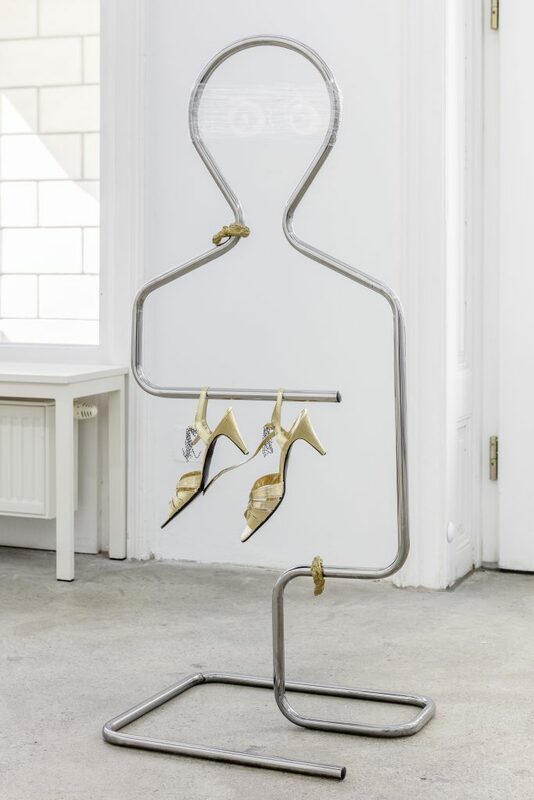 Sophie Jung, Tragedy Upon Tragedy (detail), 2017. 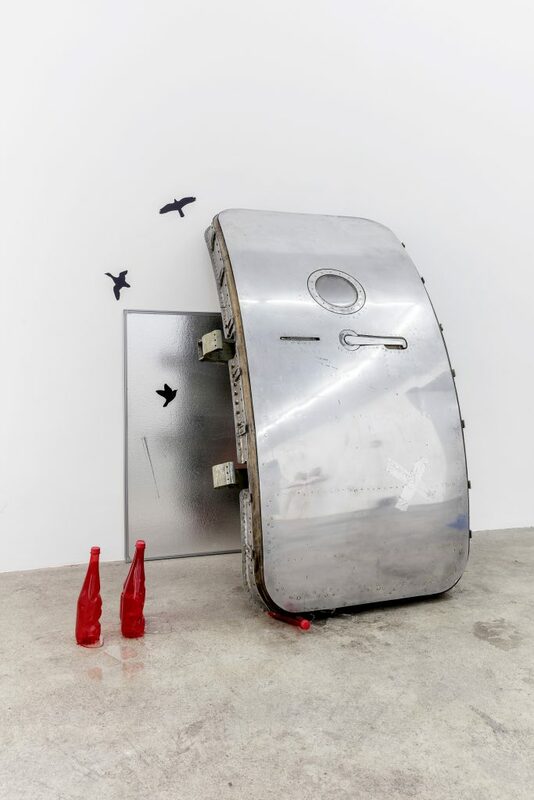 Airplane door, bird stickers, noteboard, plastic bottles, resin, metallic tape, photograph (artist’s mother) same book in different editions (artist’s father in law’s collection) rusty bolt, packing foam, tar paint, dimensions variable. Photography: www.kunst-dokumentation.com. Sophie Jung, H.E. 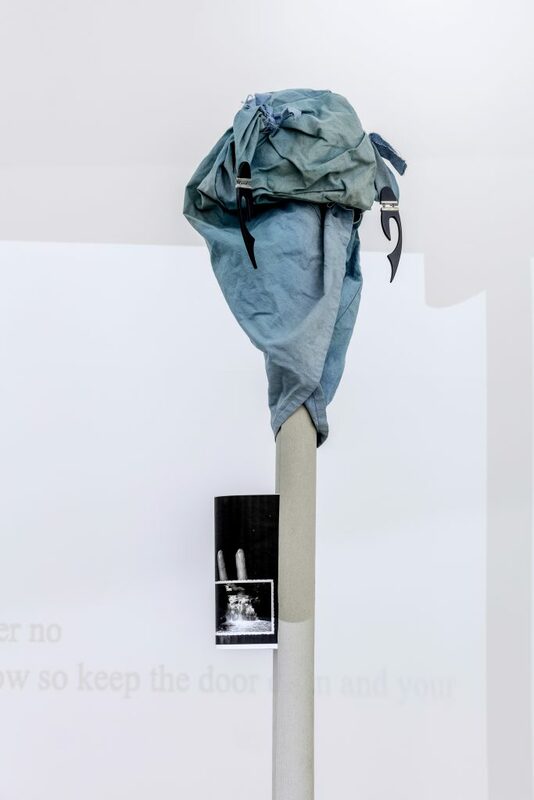 Errs Above The Ground, 2017. 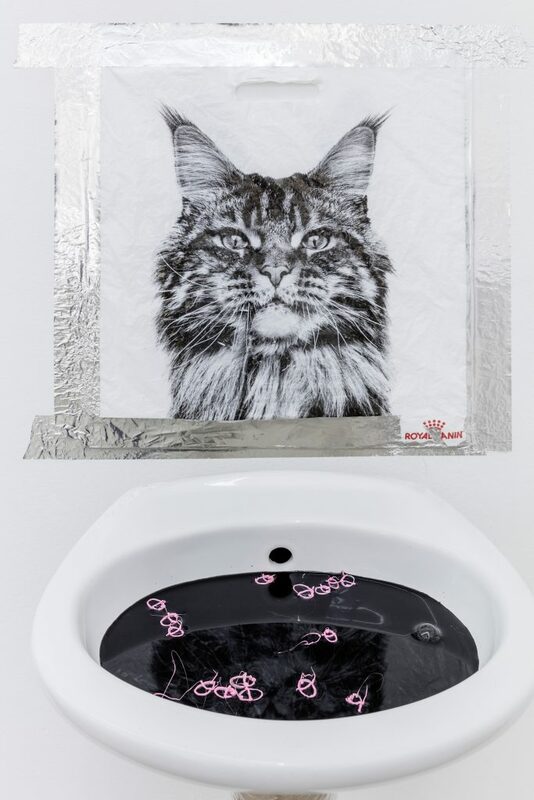 Xerox, crushed velvet, drum pad, perspex, mushroom trays, “utopia” knives, unicorn candles, plasterboard, bubblewrap, slate. Photography: www.kunst-dokumentation.com. Sophie Jung, H.E. 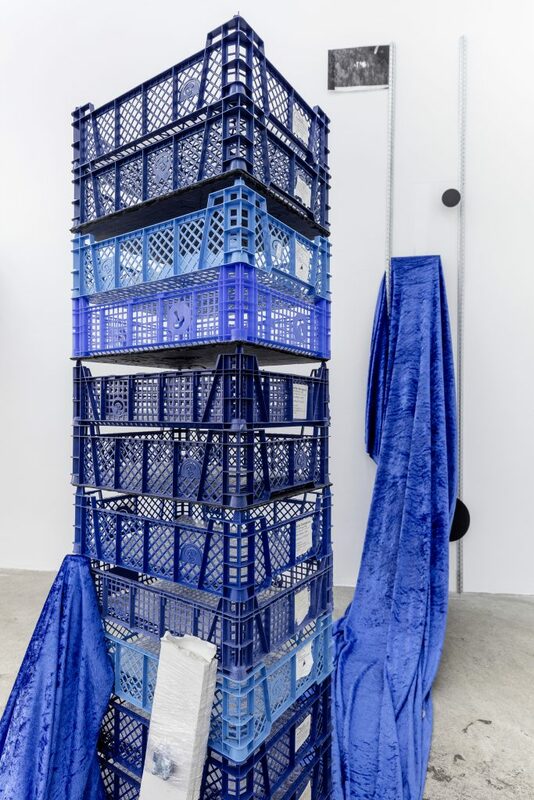 Errs Above The Ground (detail), 2017, Xerox, crushed velvet, drum pad, perspex, mushroom trays, “utopia” knives, unicorn candles, plasterboard, bubblewrap, slate, dimensions variable. Photography: www.kunst-dokumentation.com. 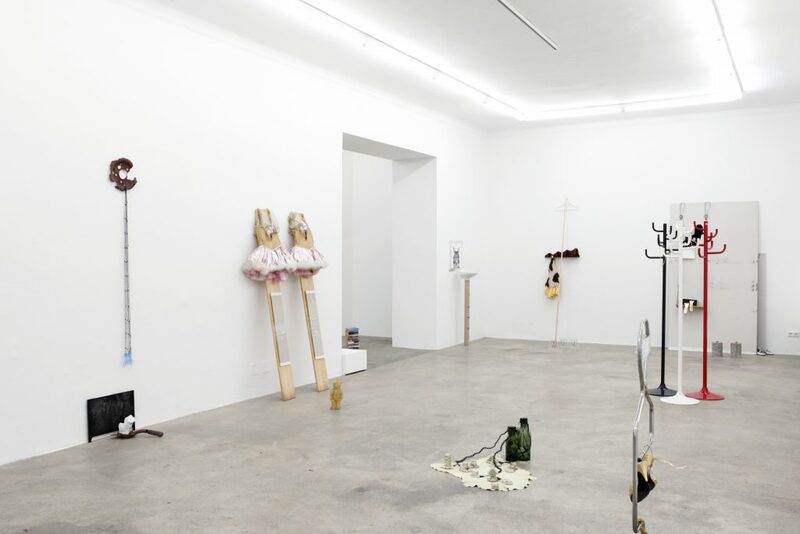 Sophie Jung, Mourning Fail, 2017, Rusty wheel (cap), mourning veil, 3D printed penises, rusty shovel, tennis sock, plastic string, perspex, dust, dimensions variable. Photography: www.kunst-dokumentation.com. 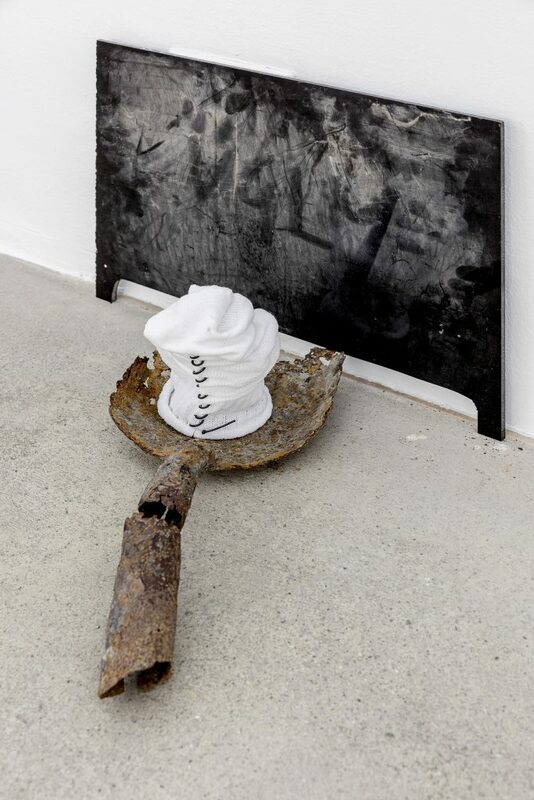 Sophie Jung, Mourning Fail (detail), 2017, Rusty wheel (cap), mourning veil, 3D printed penises, rusty shovel, tennis sock, plastic string, perspex, dust, dimensions variable. Photography: www.kunst-dokumentation.com. 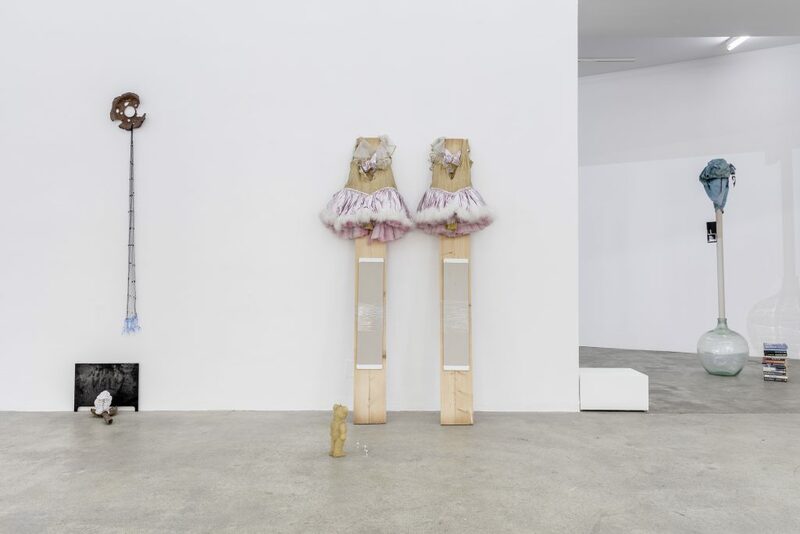 Sophie Jung, Clap Clap Clap, 2017, Ballerina dresses, fabric board, cling film, bed boards, bear candle, alien figures, dimensions variable. Photography: www.kunst-dokumentation.com. 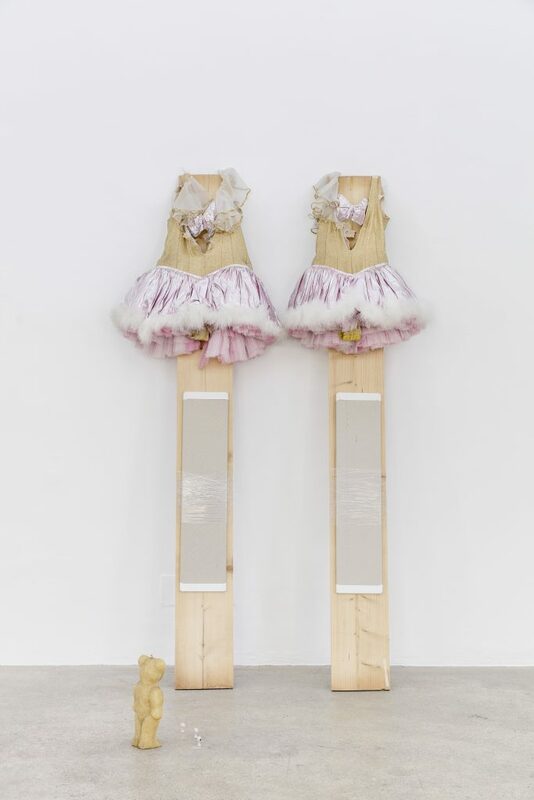 Sophie Jung, Clap Clap Clap (detail), 2017, Ballerina dresses, fabric board, cling film, bed boards, bear candle, alien figures, dimensions variable. Photography: www.kunst-dokumentation.com. 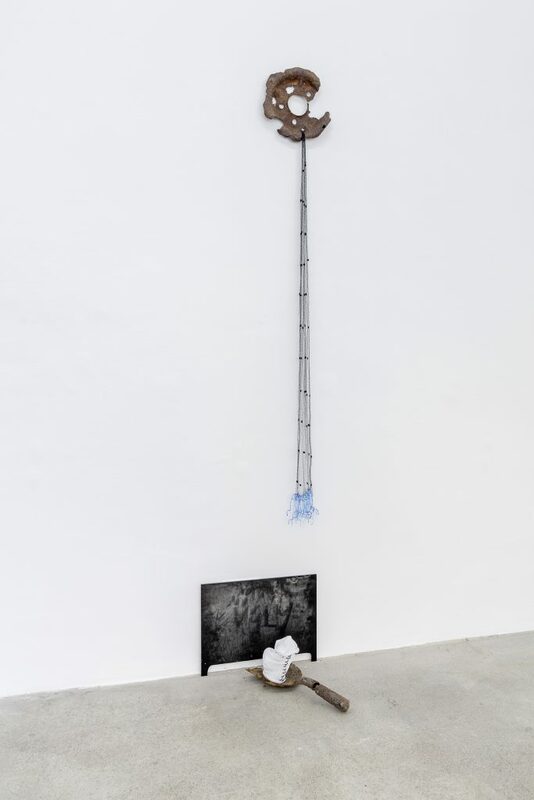 Sophie Jung, Spanische Hofreitschule, 2017, Horse mask, cardboard tube, xerox, acid bottle, stack of crime books, dimensions variable. Photography: www.kunst-dokumentation.com. 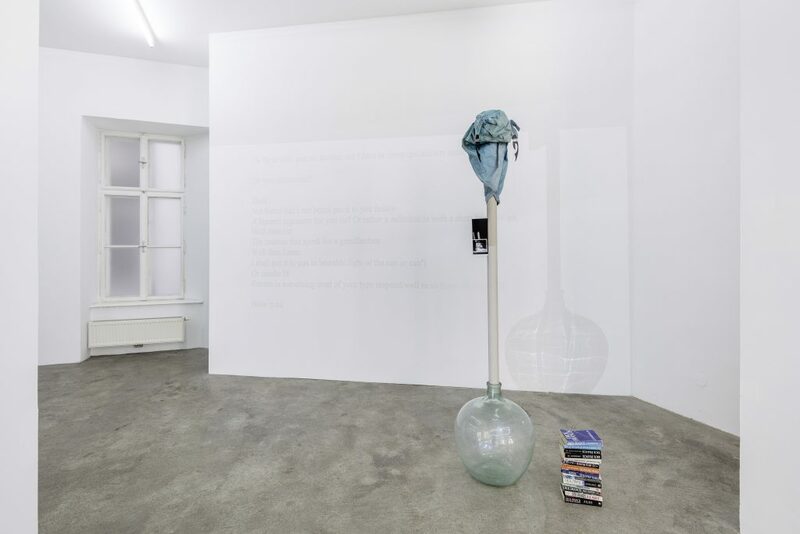 Sophie Jung, Spanische Hofreitschule (detail), 2017 Horse mask, cardboard tube, xerox, acid bottle, stack of crime books, dimensions variable. Photography: www.kunst-dokumentation.com. 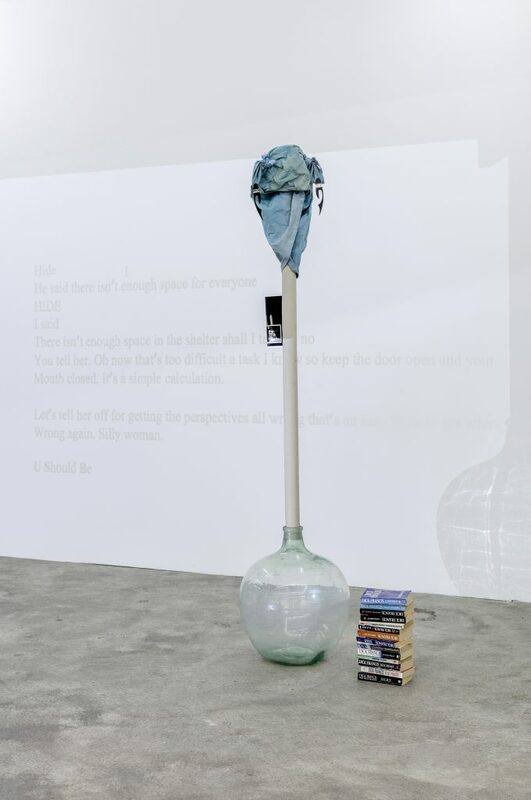 Sophie Jung, Spanische Hofreitschule, 2017 Horse mask, cardboard tube, xerox, acid bottle, stack of crime books, dimensions variable. 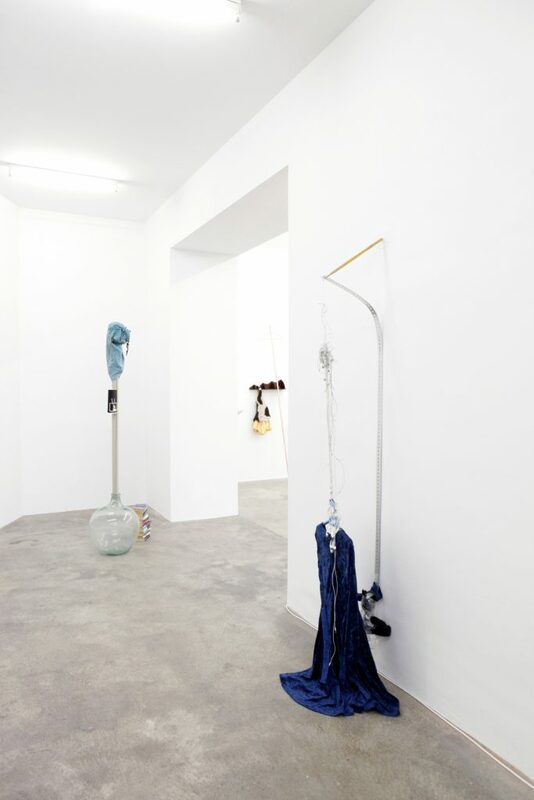 Photography: www.kunst-dokumentation.com. 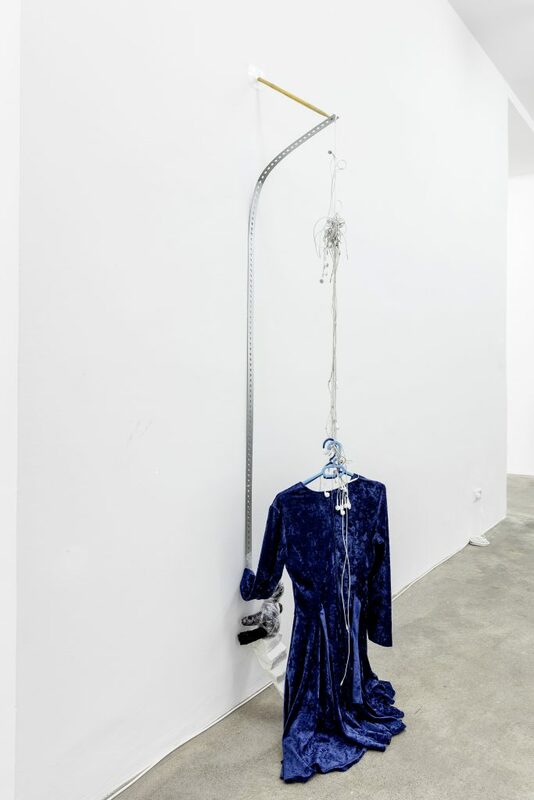 Sophie Jung, Ornament And Climb, 2017 Blue velvet dress, two clothes hangers, headphones, zink plated bar, Carrara marble, teddy from artist’s collection, cling film, drum stick, dimensions variable. Photography: www.kunst-dokumentation.com. 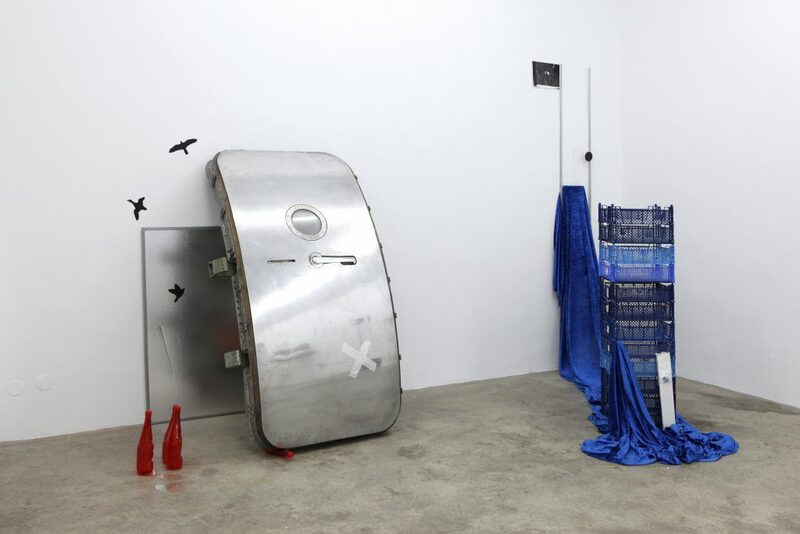 Sophie Jung, Devastatingly Neat, 2017 Cling film, cardboard tube, tar paint, carrier bag, sink, ink, 3d printed boats, silver tape, dimensions variable. 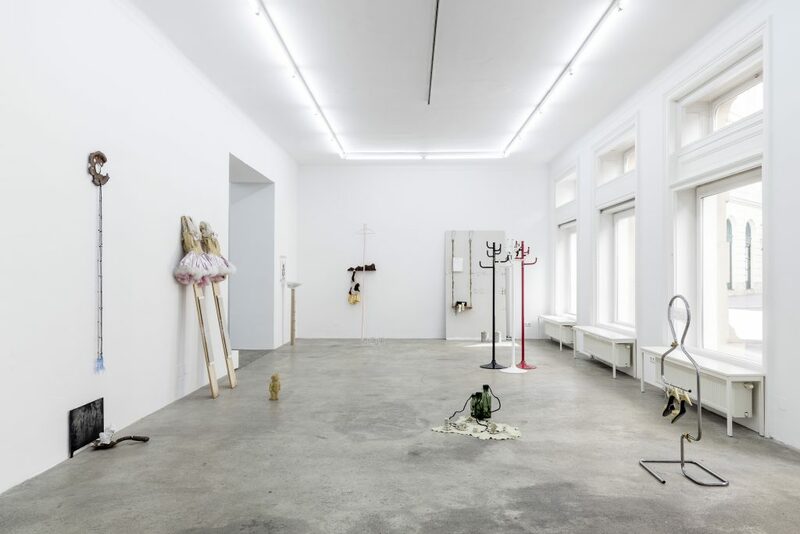 Photography: www.kunst-dokumentation.com. 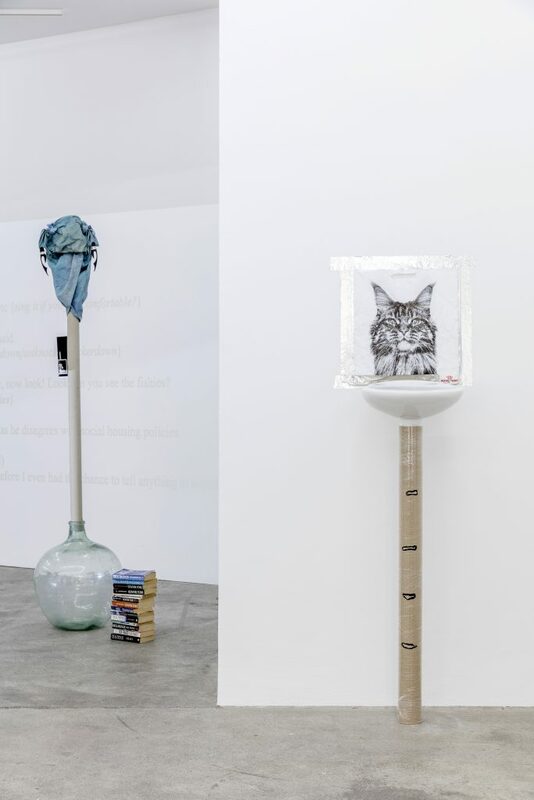 Sophie Jung, Devastatingly Neat (detail), 2017 Cling film, cardboard tube, tar paint, carrier bag, sink, ink, 3d printed boats, silver tape, dimensions variable. Photography: www.kunst-dokumentation.com. 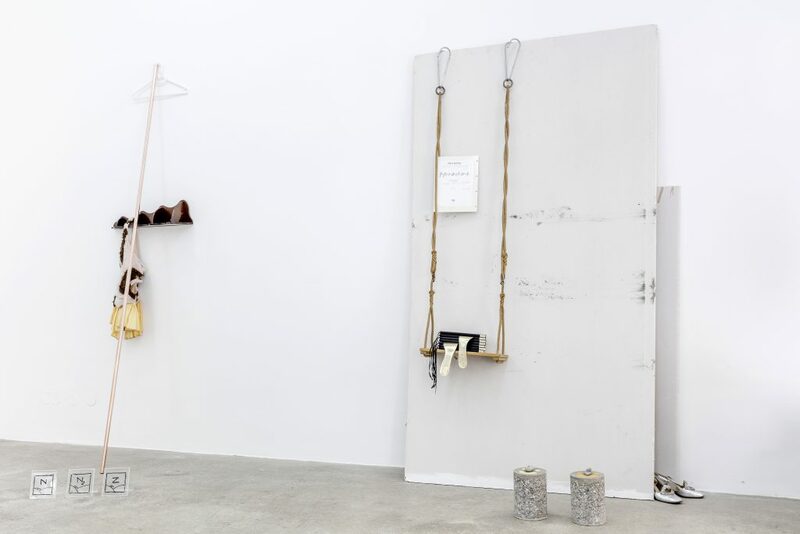 Sophie Jung, In With The Metrics, 2017, Coathanger, cornershelf, massage ball, costume “prehistory”, copper pipe, CD covers, dimensions variable. Photography: www.kunst-dokumentation.com. 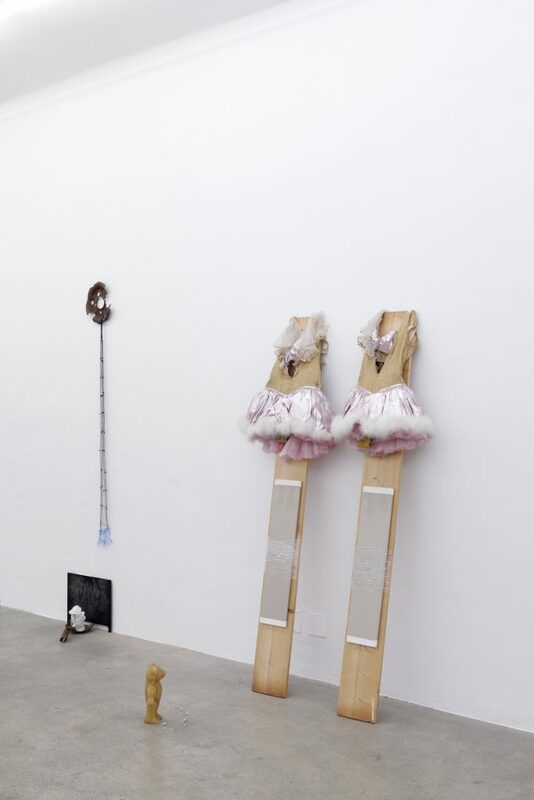 Sophie Jung, Echophenomena, 2017, Plasterboard,1st page of a Friends fan book, photoalbum page, swing, Moleskine sketch books (used), party soles, concrete, stones, antique shoes, dimensions variable. Photography: www.kunst-dokumentation.com. 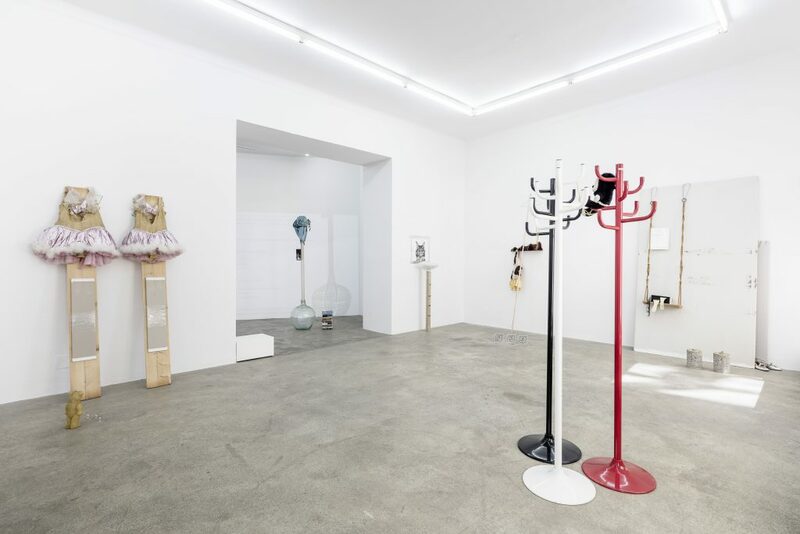 Sophie Jung, Lemme Tell You A Thing Or Two About Camouflage, 2017, Hatstands, Pandabear, magnets, dimensions variable. Photography: www.kunst-dokumentation.com. 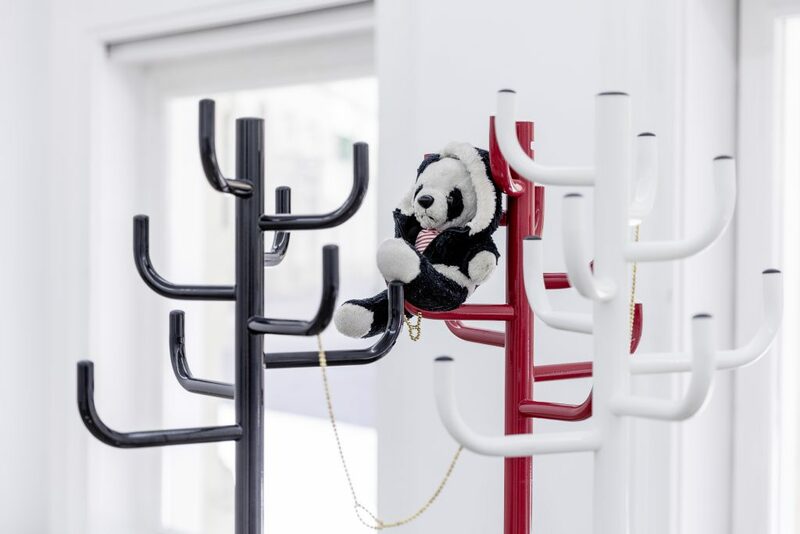 Sophie Jung, Lemme Tell You A Thing Or Two About Camouflage (detail), 2017, Hatstands, Pandabear, magnets, dimensions variable. Photography: www.kunst-dokumentation.com. 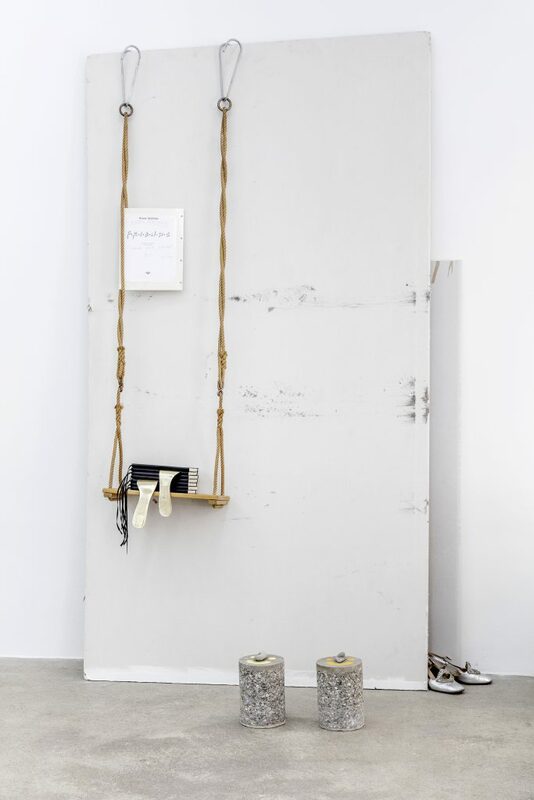 Sophie Jung, Drawing Cartwheels and Circles Over The Angry Professor’s Face, 2017, Dumb waiter, cling film, acrylic paint, paper clips, dance shoes, papiermaché, gold laque, dimensions variable. Photography: www.kunst-dokumentation.com. 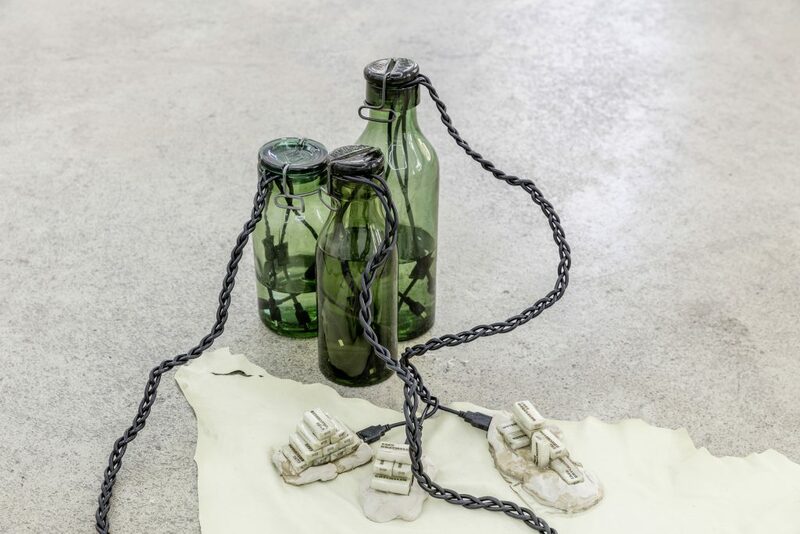 Sophie Jung, High Stakes, 2017, Bülach glass bottles, USB cables, sugar cubes, clay, resin, hide, water, dimensions variable. 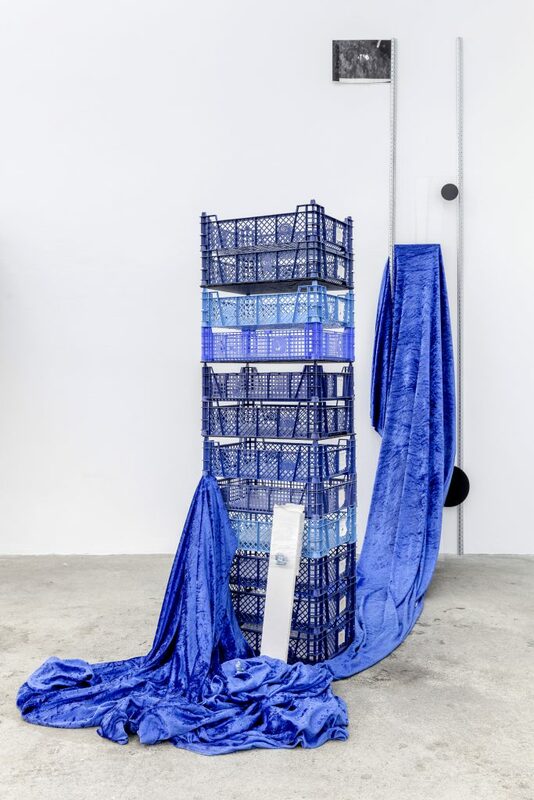 Photography: www.kunst-dokumentation.com. Although it is often said that “the clothes make the man”, it’s not without merit to note that this glib adage is a bastardization of Shakespeare’s “for the apparel oft proclaims the man”. More than mere sales pitch, the playwright’s line is just but one contained within a longer piece of advice wherein the character Polonius tells his son to live honestly and within his means—the lecture follows with the more frequently quoted “to thine ownself be true”. As platitudinous as this domestic scene from Hamlet may seem on first blush, it also portrays the hypocrisy of the speaker, an ostensible apparatchik spy for the play’s murderous usurper king. Balanced against the work as a whole, Shakespeare’s irony hints that public displays may hide private interests. In political theater the rub between what is broadcast, and what is withheld for those with “in the know” privilege should be resolved through a form of disclosure known metaphorically as ‘transparency’. 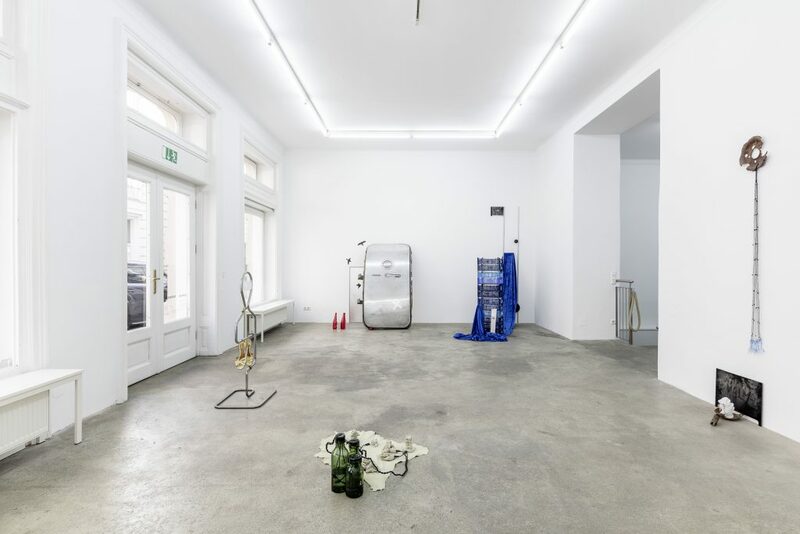 While this standard attempts to hold corporations, overnments, or even museums accountable, it wouldn’t be ideal for you to show up to the gallery aked—amongst other things, you just might catch a cold. Whatever his house might have looked like, Einstein allegedly went out of it oneday wearing two different colored socks. When queried why he did as such, he replied ‘I go by thickness, not color’. Hidden within this parable though is not a question of whose view is correct, instead it begs the question: whose window are you looking through? 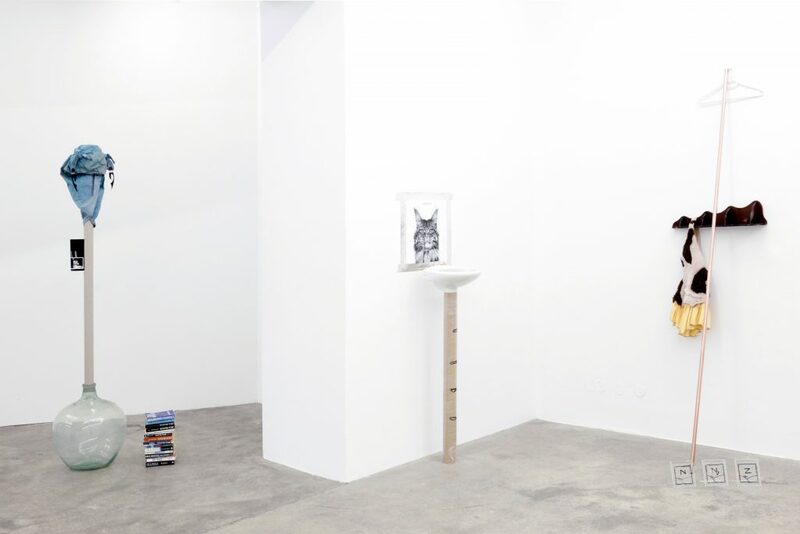 Procedurally, the works on view before you follow a straightforward methodology, give or take. 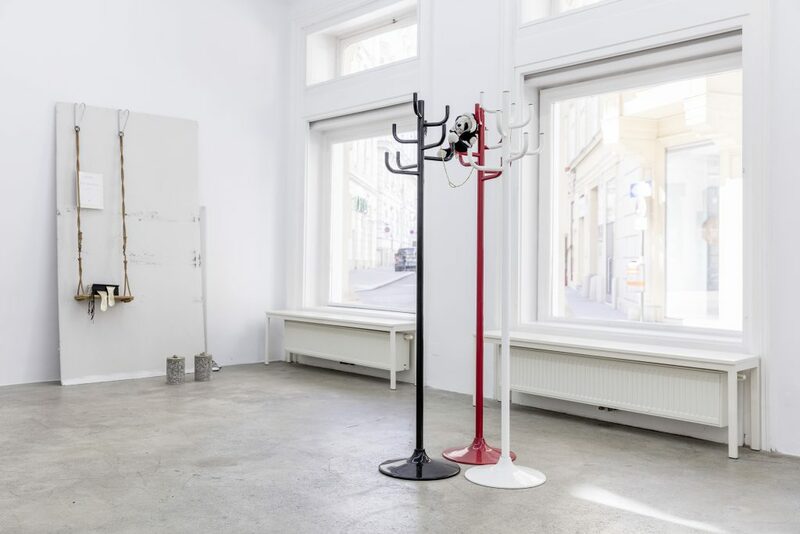 It begins as the artist scours the streets of a given city, or digs through various repositories to unearth detritus, fragments, or other scrapped things. 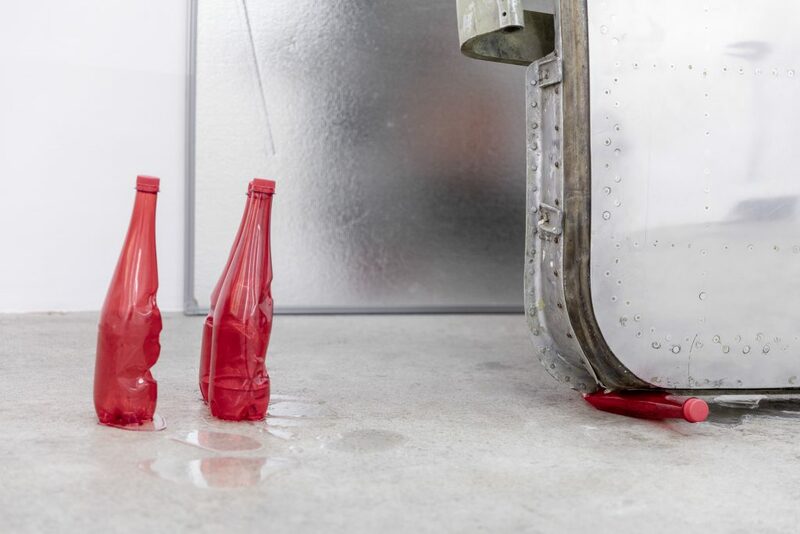 Many of these objects were mass-produced (read standardized), be they the door of an airplane, a clothes hanger, a stuffed animal or the like. Regardless of their original intention, they were estranged from it. 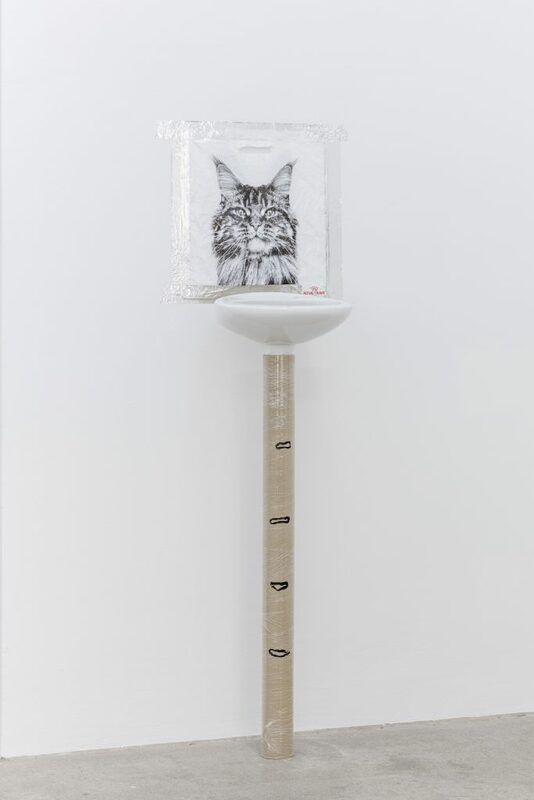 In lieu of forensics, Jung intuitively recombines said objects, and likewise collages them into the totems now before you. At their feet lay diagrams that beguilingly tease you as they parody architectural plans. 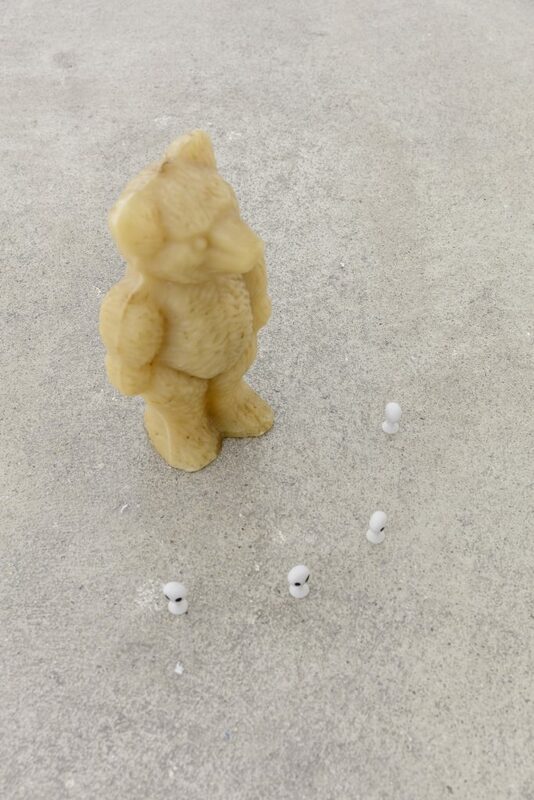 Just as a general may movie little figures around on a map, each is a speculation, generating another set of moves, which here ultimately lead to a set of associative poems spurred by the forms and logics of each set-piece. Another way to look at this however is to say that they are provocations. Do you ride a bike? If you do, I’m sure you just jump on it and go, and put little thought into the manner of riding itself. In fact, the process is so habituated that the expression ‘like riding a bike’ means a skill that once learned is never forgotten. Instead of thinking about how you don’t really think about how to ride a bike when you ride one, try to remember what it was like to first learn; were you wobbly, did you fall, were you more aware of balance, etc., than you are generally, what did you learn? As with all things, once we master them, or see them everyday, they become banal, taken for granted, and even cliché. Socially this phenomenon of acceptance is known as the status quo. Though the maintaining of relations does have countless merits, when social structures ossify around inequity, for just one many examples, new and lateral forms of thinking are required to creatively break through these formations, and articulate new patterns and ways of being. When I look at Jung’s practice, what I see is not what something looks like in the end, but instead I try to find the ways in which the images are spliced. In so doing, I learn how to look again.